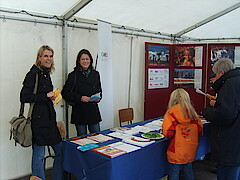 Together with other organizations, BICC will present its work in marquee 8 on Bonn’s market square. Members of staff from the peace and conflict research organization will gladly answer your questions about their and BICC’s work in general. This year’s motto focuses on sustainable consumption and consumer behavior. BICC, too, has conducted research on fair consumption within the framework of its program area “Resources and Conflict”, for instance on how cocoa, oil and gold can be produced or mined sustainably and without conflict.